250 million years ago, a mammal forerunner and an amphibian shared a burrow. Scientists from South Africa, Australia and France have discovered a world first association while scanning a 250 million year old fossilized burrow from the Karoo Basin of South Africa. The burrow revealed two unrelated vertebrate animals nestled together and fossilized after being trapped by a flash flood event. 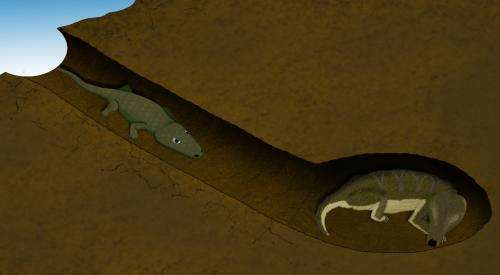 Facing harsh climatic conditions subsequent to the Permo-Triassic (P-T) mass extinction, the amphibian Broomistega and the mammal forerunner Thrinaxodon cohabited in a burrow. Scanning shows that the amphibian, which was suffering from broken ribs, crawled into a sleeping mammal's shelter for protection. This research suggests that short periods of dormancy, called aestivation, in addition to burrowing behavior, may have been a crucial adaptation that allowed mammal ancestors to survive the P-T extinction. The results of this research resulted in a paper entitled Synchrotron reveals Early Triassic odd couple: injured amphibian and aestivating therapsid share burrow and that is published in the scientific journal, PLoS ONE, on Friday, June 21, 2013. The international team of scientists was led by Dr Vincent Fernandez from Wits University, South Africa and the European Synchrotron Radiation Facility (ESRF) in Grenoble, France. The other authors from Wits University include Prof. Bruce Rubidge (Director of the newly formed Palaeosciences Centre of Excellence at Wits), Dr Fernando Abdala and Dr Kristian Carlson. Other authors include Dr Della Collins Cook (Indiana University); Dr Adam Yates (Museum of Central Australia) and Dr. Paul Tafforeau (ESRF). After many impressive results obtained on fossils, synchrotron imaging has led to revived interest in the studies of the numerous fossilized burrows discovered in the Karoo Basin of South Africa and dated to 250 million years ago. The first attempt to investigate one of these burrow-casts surprisingly revealed a world-first association of two unrelated animals. The fossil was recovered from sedimentary rock strata in the Karoo Basin. It dates from 250 million years ago, at the beginning of the Triassic Period. At that time, the ecosystem was recovering from the Permo-Triassic mass extinction that wiped out most of life on Earth. In the Pangea Supercontinent context, what is now South Africa was an enclave in the southern half called Gondwana. It was the scene of pronounced climatic warming and increased seasonality marked by monsoonal rainfall. To survive this harsh environment, many animals, including mammal-like reptiles (mammal forerunners), developed a digging behavior, attested by the numerous fossilized burrow casts discovered in the Karoo Basin. These casts have long been thought to enclose fossilized remains, triggering interest from palaeontologists. Early this year, an international group of scientists started to research the contents of these burrows using X-ray synchrotron computed microtomography. Two burrow casts were selected from the collection at Wits to be scanned using the state-of-the-art facility at the European Synchrotron Radiation Facility (ESRF). Using the unique properties of the X-ray beam which enables non-destructive probing, the scan of the first burrow started to reveal the skull of a mammal-like reptile called Thrinaxodon, an animal previously reported in another burrow. 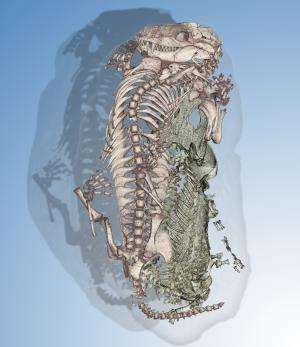 As the scan progressed, the three-dimensional reconstruction displayed results beyond expectations: the mammal-like reptile was accompanied by an amphibian Broomistega, belonging to the extinct group of Temnospondyl. "While discovering the results we were amazed by the quality of the images", says lead author Fernandez, "but the real excitement came when we discovered a second set of teeth completely different from that of the mammal-like reptile. It was really something else". Besides the pristine preservation of the two skeletons, the team focused on the reasons explaining such an unusual co-habitation. Fernandez explains: "Burrow-sharing by different species exists in the modern world, but it corresponds to a specific pattern. For example, a small visitor is not going to disturb the host. A large visitor can be accepted by the host if it provides some help, like predator vigilance. But neither of these patterns corresponds to what we have discovered in this fossilized burrow". The scientists gathered all the information to try to reconstitute the events that led to this incredible fossil aggregation, testing scenarios one after another. "It's a fascinating scientific question: what caused the association of these two organisms in the burrow? One of the more obvious possibilities is a predator-prey interaction, but we inspected both skeletons looking for tooth marks or other evidence implying predation, ultimately finding no support for one having attempted to feed on the other," says Carlson. His colleague, Cook, adds that the consecutive broken ribs resulted from a single, massive trauma. The amphibian clearly survived the injury for some time because the fractures were healing, but it was surely quite handicapped. According to Fernandez this Broomistega is the first complete skeleton of this rare species that has been discovered. "It tells us that this individual was a juvenile and mostly aquatic at that time of its life," he says. The scientists eventually concluded that the amphibian crawled into the burrow in response to its poor physical condition but was not evicted by the mammal-like reptile. Numerous Thrinaxodon specimens have been found in South Africa, many of them fossilized in a curled-up position. Abdala says: "I have always been fascinated by the preservation of Thrinaxodon fossils in a curled-up position that show even tiny bones of the skeleton preserved. It's as if they were peacefully resting in shelters at the time of death". The shelters prevented disturbance of the skeletal remains from scavengers and weathering. "We also think it might reflect a state of torpor called aestivation in response to aridity and absence of food resources," Abdala says. Piecing all the clues together, the team finally elucidated the enigmatic association, concluding that "the mammal-like reptile, Thrinaxodon, was most probably aestivating in its burrow, a key adaptation response together with a burrowing behavior which enabled our distant ancestors to survive the most dramatic mass extinction event. This state of torpor explains why the amphibian was not chased out of the burrow," says Rubidge. Both animals were finally entrapped in the burrow by a sudden flood and preserved together in the sediments for 250 million years. Tafforeau says: "Thanks to the unique possibilities for high quality imaging of fossils developed during the last decade at the ESRF, these unique specimens remain untouched, protected by their mineral matrix. Who knows what kind of information we'll be able to obtain from them in the future and which would have been completely lost if the specimen had been prepared out of its burrow cast?" While this is a rare and beautiful find, I'm not sure it is behaviourally significant. Burrow-sharing across species is a known type of commensalism (e.g. badgers and red foxes sharing the same dens) but is seems more plausible these poor 2 creatures were completely freaked out in the face of disaster. On a different track, I wonder what the fundies will say. OMG, an evolutionary article that talks about a flood! More likely, the fundies will be, like "OMG, mammals and amphibians living together, what was the world coming to! Very sad fate for both of these animals. They claim that the reptilian-mammal was asleep, but it looks as though both animals were trying desperately to escape from the floods. The state of preservation of these fossils is exquisite. Well, since the two people doing the down ranking haven't got any opinions of their own, I'm not going to take it as an insult. I would have to read the paper, but seeing how handicapped the amphibian was it is likely it had entered the burrow before the flash flood which seems to have been the paper's conclusion. The behavioral finds would revolve around that constraint, e.g. the torpor that the amphibian would rely on to intrude et cetera. Did the amphibian leave any prints indicating it crawled up the burrow or could it in fact've been swept up there by the flood? For that matter could both of them've been swept up there? Could the mammal just have killed the reptile for dinner, dragged it into its den, and subsequently be killed itself by the flood while taking a nap before actually consuming its dinner?